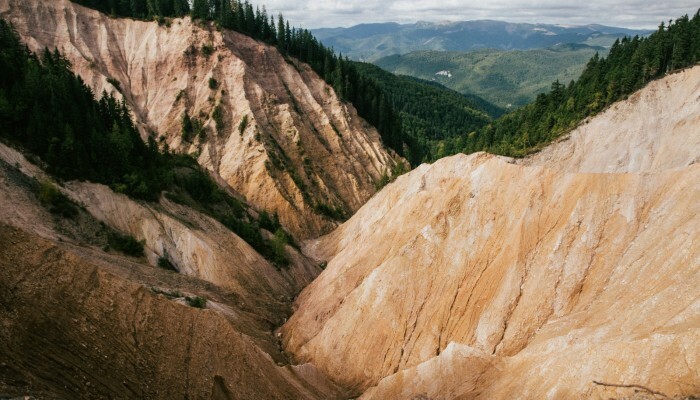 The Apuseni National Park, in Romania, is a geoscientists paradise. This 187,000 acre Park in the Western Carpathians boasts caves, deep valleys and gorges, karst landscapes, rocky steep walls and underground watercourses. The sheer beauty of the landscape is captured in today’s Imaggeo on Mondays image featuring the Groapa Ruginoasa, a deep sandstone ravine. “Locality names of morphological features often allow for drawing conclusions on the geological processes that shaped them,” says Martin Reiser, who took the photograph. The steep, barren slopes of the so called “Groapa Ruginosa” (Romanian for rusty pit) nature monument show a stark contrast to the gentle morphology and green woods of the Apuseni National Park. This spectacular ravine was shaped by headward erosion of an intermittent stream in the Valea Seacă (“Dry Valley”). Headward erosion occurs at the start of channels and streams, causing the origin to move backward and thus elongating the water course. The steepness of the slope on which the channel forms contributes to the speeding up of the erosive processes. The “rusty pit” is about 100 m deep and measures ca. 600 m across. Although there are no studies on the rate of erosion at this locality, geological maps from the late 19th century show a fairly small extent of this morphological feature. “The yellowish to reddish colour of the eroded Permian to Lower Triassic sediments (sandstones, conglomerates and phyllites) gave the ravine its name,” explains Martin. Further downstream, the name of the Valea Galbena (“Yellow Valley”) also relates to the colour of the stream that carries the eroded sediments. By Martin Reiser, University of Innsbruck and Laura Roberts Artal, EGU Communication Officer.